Illustration by Edward Winsor Kemble (1884). A thrashing is a severe, merciless spanking or beating, so hard that the word spanking would not do it justice. 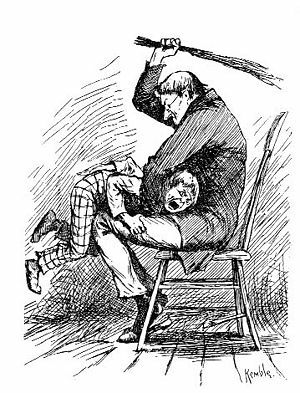 In a region where corporal punishment is acceptable, the term thrashing would not necessarily imply a particularly severe chastisement. Often the term thrashing is preferred over spanking even if it isn't particularly severe at all because 'spanking' has connotations of little children's punishment. 'Thrashing' then simply refers to any corporal punishment for older children. The term beating, in contrast, would imply an abusive chastisement. The word thrashing (to thrash) comes from Middle English thrasshen and has common roots with the verb to thresh. "Nun wollen wir sie aber dreschen" (Now let us thrash them), political propaganda postcard from Germany, World War I. "Europäischer Dreschplatz" (European Threshing Floor), referring to thrashing/threshing. This page was last edited on 25 November 2015, at 17:48.